This wonderful, old home at 100 Polzin Street in Coupland is for sale. It has four bedrooms and an office. I use one of the upstairs bedrooms as my study. There are two full bathrooms, one downstairs and one upstairs. There is plenty of storage space in the attic as well as a two-room building in the back yard and an old barn, both of which are fixer-uppers but are basically sound. Sitting on about 2 acres of land, the home is surrounded by grazing pastures on three sides. Plenty of room for just about anything. It has a nice front porch with a great porch swing, although because it is white and almost edge-on to the camera in this picture, it is nearly invisible on the right side of the porch. The back yard has a patchwork patio, is completely fenced, and is a great spot for dogs and children with lots of shade. From my windows upstairs, looking south I can see downtown Coupland and the steeple of St. Peter’s Church. To the north, through the branches of a beautiful, old oak tree, I have a view of Scott Ging’s herd of Black Angus cattle and the tree-line of Brushy Creek in the distance. There’s nothing quite like watching newborn calves frolicking in a green pasture. The stock tank in the middle of the pasture attracts some beautiful birds. To the northeast, east, and southeast are fields cultivated by Max Marosco. To the south and west are wonderful, helpful, and quiet neighbors. They have been very understanding of the wanderings of our cat, Blackie the Christmas Kitty, who was abandoned by a family that had moved out from across the street. We adopted her when she showed up on Christmas Day in 2012 with an injured leg. We thought she had left with the family a few days before. She’s a good mouser and a survivor. One of the most valuable features of the home, to me anyway, is its location in a remarkably predator-free area. We have raised a flock of free-range chickens here for two years now and have not lost a single adult chicken to predators. A rat snake got a chick once (and then he couldn’t get back out through the chicken wire) and we think an owl got another chick that was out after dark but that’s about it. One of our dogs got a few pullets from our first generation of chickens but we broke her of that predilection and now canine and poultry co-exist with only the occasional spat. There are five fruit trees in the chicken/garden yard, which is separate from the back yard. One fruit tree is new this year (a plum tree) but the other four (another plum tree, two peach trees, and a fig tree) are well-established and look like they might bear some good fruit for the first time this year. There are several areas of improved soil where we planted vegetables in past years. They are covered with grass now but it wouldn’t take much to make them productive again. There is a faucet in the middle of the chicken/garden yard. By strategic opening and closing of windows and curtains, we use air conditioning only from June – September and even then, most nights you can open up after it cools down outside. There is very good air flow through the house. The home is not officially listed yet but if you want more information, call Loretta Patschke at 512-797-5842. This isn’t everything there is to know about this property . . . just everything that is important to me. I’m grateful for the time I had in this home and I’m sorry to have to say good-bye to it. Were it up to me, I would sit tight, raising chickens and pursuing other dreams and possibilities right here. Alas, I must move on but I hope that a new family will come to love it as much as I have. This entry was posted in For Sale, What's New? and tagged 100 Polzin St Coupland Texas, Home for Sale on March 16, 2015 by Stewart Dale Spencer. Best of luck in selling your home-I’m sure you won’t have any problems! 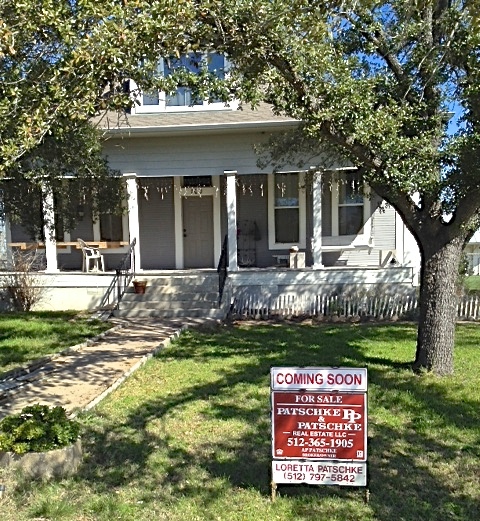 We live in Coupland also and just sold our house on Herrin w/Mrs. Patschke as our listing agent as well. Even though I have never embraced the “Coupland lifestyle”, since I consider myself more of a town girl, there are a few things I do like about Coupland. I very much enjoyed reading about your interesting historic home, and your time here. Jenny, I remember posting the story about your home being up for sale. Thanks for the well-wishes!